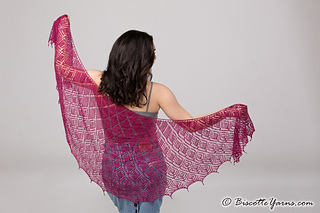 Original shawl design by Lana Jois for Biscotte Yarns. Available in two sizes, this beautiful shawl is worked with our CashSilk Lace. 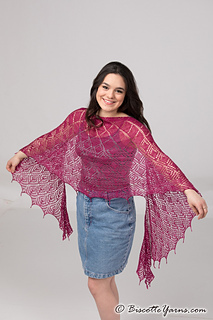 The shawl pattern includes both charts and written instructions. Diamond motifs are arranged like crystals on a lattice of lace in this delicate shawl. 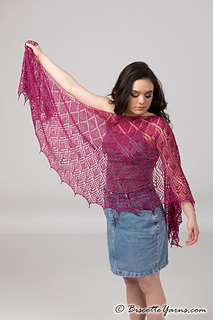 Paired with the luxurious CashSilk Lace yarn, this shawl is a delight to make and lovely to wear. The shawl is knit from the top down and may be worked from charts or written instructions. Needles US Size 4 (3.5mm): 32” circular (cir). Circular needles are used to accommodate large number of stitches. Adjust needle size if necessary to obtain the correct gauge.